The word ‘Igloo’ comes from the Inuit Language also known as a snow house or snow hut. Inuit people have managed to live Arctic tundra for about five thousand years where the temperature ranges from -40c to -60c in winters. 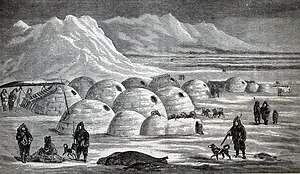 The majority of the Inuit people used to live in normal brick houses, but when on hunting trips, igloos were their temporary dwelling houses. Although some people used igloos as their winter residence, and some communities went as far as making igloo-villages…igloos were still temporary. The smallest igloos were constructed as temporary shelters, usually only used for one or two nights. These were used during hunting trips. Intermediate-sized igloos were for semi-permanent, family dwelling. This was usually a single room dwelling that housed one or two families. The largest igloos were normally built in groups of two. One of the buildings was a temporary structure built for special occasions, the other built nearby for living. The material plays the most significant role in the working of an igloo. Igloos are built from compressed snow, it is mostly the blown snow cut down by knives into blocks. Unlike ice, compressed snow has many air pockets, and as air is an insulator, snow works best for the construction of an igloo. Simply, snow doesn’t let the heat get through easily, thus the heat produced by your body or by a fire (inside the igloo) stays in. The inside of an igloo is tiered. Generally, it is divided into three levels (heights). The most upper level is the place where one sleeps. Since hot air rises, and you want to be as close to the heat as possible. Ground level is the workplace, this is the place you put the fire for the most part. The third level is underneath the ground, sort of a hole also called “cool dump”. This is the place all the cold air gets dumped when the hot air rises. The structure of a well-made igloo is strong enough that a man can stand on its rooftop. If there is no wind and you’re sitting idle, your surrounding air will start getting warmer, and you’ll be more comfortable. An igloo protects you from those chilly winds too, which if not make you warm. With the right fit and the right physics, snow can actually keep you warm. Source: Medium – How Igloos Keep people Warm?